What makes you happy? I spent an entire weekend at home…during the summer! A rare occurrence for me. After all the traveling I have done this month, a weekend at home made me really happy. Because my slight knee injury is preventing me from taking part in my usual leisure activities, I will share two photos of what makes me happy at this moment. This is a photo I took three years ago, the last time I visited La Ventana, Baja, Mexico. 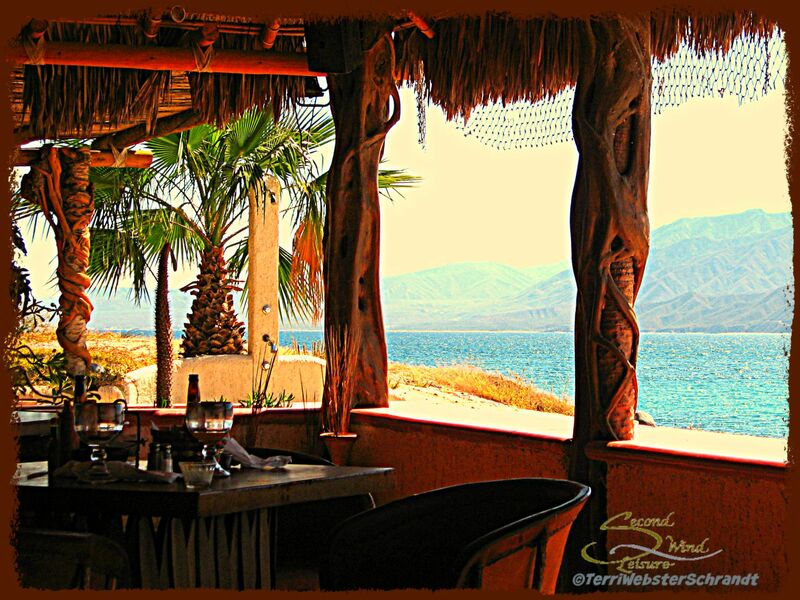 This was the view from a restaurant of a small bay called Bahia de los Suenos (Bay of Dreams). After a long day snorkeling, we stopped for a late lunch at this restaurant. I just loved this view. 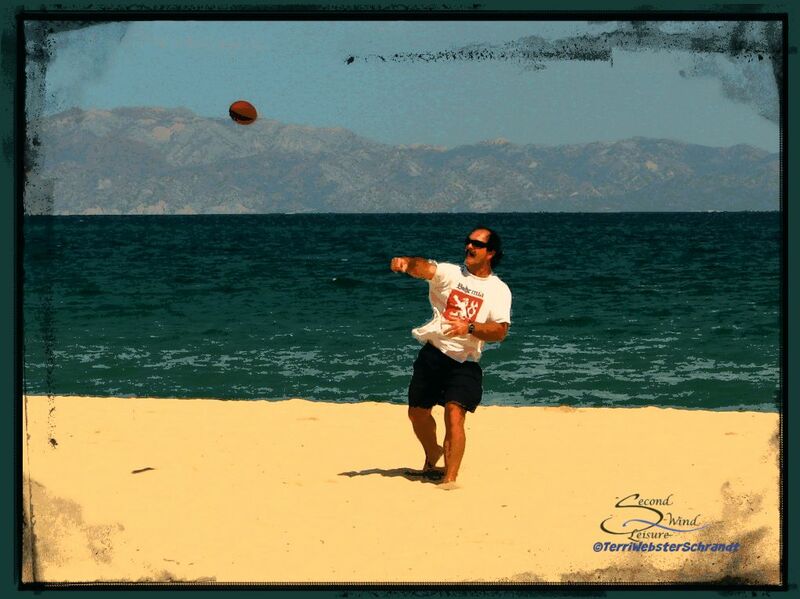 The subject of this next photo is what REALLY makes me happy: watching my hunky hubby tossing a football around with some younger guys on the beach near the resort in La Ventana. My hubby used to play football in high school, and he played the “other futbol” for years as an adult. An NFL football game was on TV as I read the Sunday Stills challenge. Sometimes we manage to find other fun ways to get our leisure on when the wind is not blowing. We are booked for La Ventana this coming winter. I will be very happy to go back! Let me ask you again…what makes YOU happy? I am sorry to hear of your knee injury! Get well soon as winter is arriving and you be fit for La Ventana! Oh yes, this place would make me happy too, as well as windsurfing or cycling anywhere in the world. Thank you, Lucile, it’s getting better every day! Great to hear, Terri. How was your first week back to teaching? It was better than I thought. I didn’t miss a beat and the students are lovely! That’s wonderful, Terri. Keep enjoying it. Love the location and you both look like you are having fun. You are right that happiness is being happy. Thanks Terri for linking up with us at #WednesdaysWisdom and see you next week. I can see why La Ventana and your hubby playing football make you happy 😉. 😊Awwww. You are lovely to say so Terri! One of things that makes me happy is when I am writing. Letting my mind run wild without having to worry about it brings me a lot of pleasure. Whether I publish what I have written it a new different ball game but when it brings results then the happiness is inflated. Your lovely compliments have me really happy, Terri 🙂 Thank you so much. Nice, happy post! All of your activities would have made me happy, also! I love being outside with my family and/or my horse – that’s what makes me happy! Thanks for the post! Thank you! How lucky for you to have a horse! I had one when I was 9 years old and will never forget riding her all over rural Central Oregon 🙂 Those were happy times! The mountains in the background look amazing. Have you ever driven or hiked in the area? looks like happy fun. These “mountains” are on an island 10 miles away. Never hiked those. I can see why both make you happy, Terri. Nice to be away and nice to be home. One always makes me appreciate the other. Sounds as though it’s that way for you, too. Very well said, Janet! I am very happy to be home and teaching part-time again. We have a big trip planned for late December, early January to La Ventana (pictured). Gonna rest up! I need more leisure, rather than just nothing to do. But first I need to get healthy. Being with my grand baby!! Great photos and view. I can see why it makes you happy. I thought staying home and not getting up early was to be happy. After a little while, I started to go among the masses and learn all over againg what life is all about. The simplest of things. Thanks for sharing Terry. Feel better with knee Cara. Thank you, Cara! it’s nice to get out and experience life! I love that photo, it looks really relaxing. Okay, I’ve seen this in a few places and it’s bothering me now. What’s with the “futbol” spelling? That’s the Spanish spelling. NFL football is completely different than soccer, known as football to the rest of the world. My husband is of Chilean descent on his mother’s side, so that’s why I spelled it that way. he played both sports. La Ventana looks wonderful! I can see why that makes you very happy. Thanks, Janis! I can’t wait to go back next January!